It was a perfect Sunday afternoon, cloud-clear and warm, with an east-northeasterly sea breeze of 5 - 10 knots. And the Harbour autumn-empty, after the bedlam of summer weekends. Five boats presented, following two late scratchings. 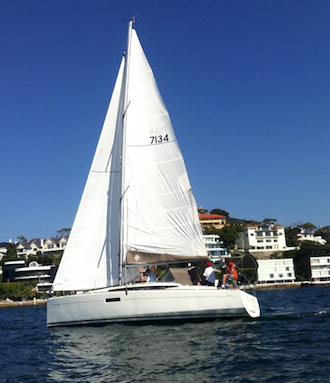 Notable among us was a beautiful boat, new to the fleet and perhaps new to the water, a Jeanneau Sun Odyssey 34 Sanity owned by Jim Ley, one of the earliest of DBSC’s sailors. Jim starting winning trophies in the 1950s, sailing VJ dinghies at the newly formed DBSC; his father was among the Club’s founders. Jim went on to win many trophies in many classes in many other clubs. This was his return to sailing at DBSC, after fifty years. Welcome back! Peter and David gave us a timed start from one of the Club’s RIBs, the Paul Adam. Sanity and Time & Tide started best, with Sanity going left into the Harbour and finding better wind for a strong early lead. Corinna’s start was late (again) but the first leg was a work and she made characteristically good speed and height and the order at the first mark at Point Piper was Sanity, Corinna, then T&T, with Bruce’s Liaison and Ed’s G-Force following. Remarkably, that order held throughout the race but there is still a story to tell. The leg to Taylors Bay was a shy reach and the two smaller boats kept pace with Sanity, with T&T closing on Corinna. Then, on the long work to the top mark off the Sow’n Pigs reef Corinna stretched her lead again, with T&T hanging on and Sanity still clear in front. There followed two downhill legs to Shark island, where we gybed, and then a run to the finish. Sanity, with a comfortable lead, left her spinnaker below, but Corinna and Time & Tide both flew kites. On the leg to Shark Island the spinnaker was a marginal exercise as the apparent wind was square for much the leg and forward of square for the rest. And we both struggled for height, with the spinnaker pole way forward and its luff collapsing, to clear the mark. Corinna did it better and turned the mark clear of T&T and closing on Sanity. Often the last leg of the race is the least interesting - the places already determined. This time the spinnakers made a real difference. The wind was square behind us, and on Corinna and T&T, the crews winched their spinnaker poles back and easily kept the kites full and way out to starboard, clear of their mainsails. Both closed on Sanity, whose crew - sensing the danger - goose-winged her headsail to starboard, to get the same freedom from the mainsail’s wind-shadow. T&T was moving faster than either and It seemed that positions could change, especially if the wind was uneven. Close to the line, Sanity did fall into a hole that Corinna escaped; Corinna came abeam of her on a light gust - and then the gust reached Sanity and she surged to cross first, by not much more than a boat length. For T&T, she had allowed the others too great a lead (or the leg was too short!) and, despite her speed, she was still a few boat lengths back when we crossed the line. A few us enjoyed drinks in the Clubhouse afterwards - it was the best of afternoons. The summer harshness had gone from the sun, the breeze was cooling and gentle. We all stayed longer than we intended. So - a great race on a sparkling afternoon. 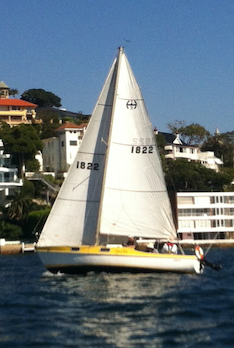 At the start, just south of Clarke Island - Sanity (at right) shades Bruce’s Liaison. The boat ahead on port is T&T. Sanity was able to clear the Island still on starboard, and go left for a big early lead, which she did not relinquish. Though, by the finish, Corinna was within an outstretched arm of catching her, and T&T well within hailing distance.